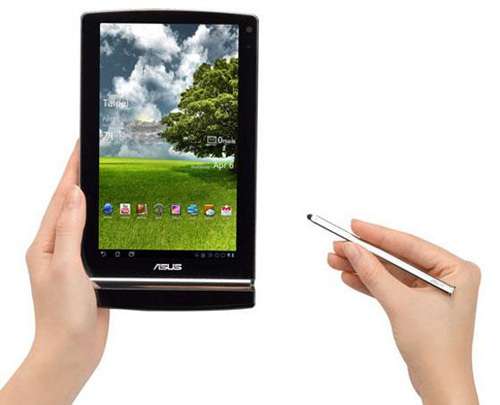 The Eee Pad MeMO tablet was announced back in January at CES 2011, but today Asus has updated it, giving it a glasses-free, multi-touch (1280 x 800) 3D IPS display which can be used either with finger and with the supplied stylus. The portrait-oriented, 7-inch Honeycomb OS powered tablet will offer 3D content thanks to a 1.2 GHz dual-core Qualcomm processors and backed by WiFi, Bluetooth, GPS, and two cameras – a 1.2MP in front and 5MP at the back. Now codenamed Eee Pad MeMO 3D, the Android tablet also will come bundled with MeMIC Bluetooth headset and is expected to go on sale next month.